Received the following message a few weeks ago, lost it, then found it again. Owner of 2nd "330 SS Formula"
First one named "Day Dream". Both are white with blue trim. Wife Ruth and I use the boat in South Florida for cruising and rendezvous. Also we are continuously entertaining our guests in Florida in winter. Sometimes it's easier to come up with a boat name by visualizing other people's names on their boat or stuff. Here are a few boat names, in action, from customers of CustomBoatNames and BoatNameGear. BoatU.S. announced their top 10 list of most popular boat names today, reflecting what their vinyl lettering customers purchased throughout 2009. The top BoatUS boat names this year are not dramatically different from past lists, with “Bail Out” being one of the most notable and clever additions - obviously reflective of the economic times. 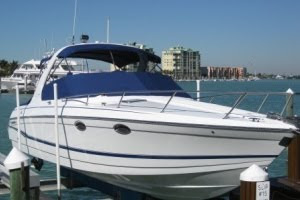 Of course, if you're superstitious, boat names that imply bad things happening to your boat – such as "Bail Out" and more notably "On the Rocks" - are probably not for you. Namaste is an interesting addition, but whether the boat owners who bought lettering with that name were referring to Yoga or ABC’s Lost is a mystery. Are people still naming their boat after a phrase from a sitcom that aired over 12 years ago? Sure, who doesn't love Pink Floyd, but does a 30 year-old smooth classic rock song really get put on the back of that many boats? 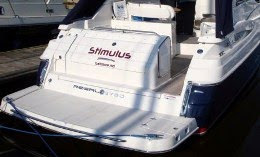 Our previous top ten boat name list can be found here. What's your favorite boat name?